Good times, bad times, you know he’s had his share. 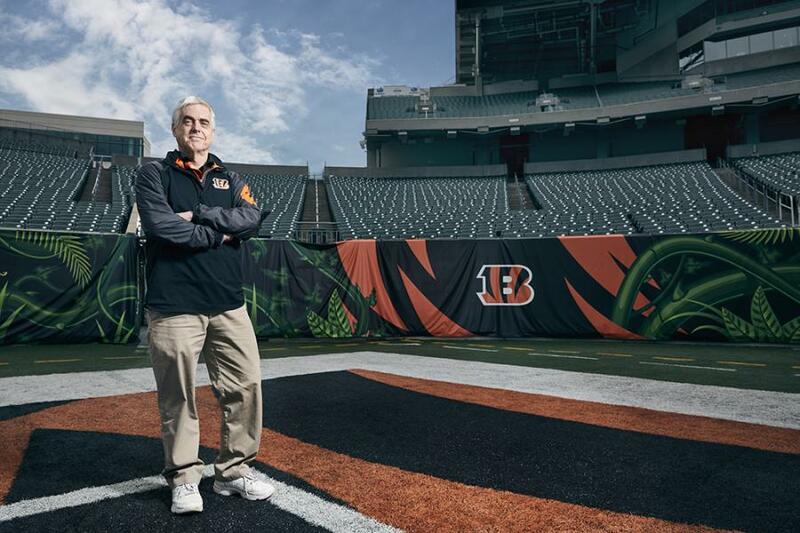 But over 23 years of grappling with the press, herding moody players, and managing the team’s publicity issues, the departing PR director of the Cincinnati Bengals has stayed positive. Amazingly. For much of the 1990s and early 2000s, public relations director for the Cincinnati Bengals seemed like the worst job in professional sports. Jack Brennan would argue otherwise. After a decade spent covering the team for The Cincinnati Post and The Cincinnati Enquirer, the Texas native took the position in 1994—the throes of the franchise’s “Lost Decade”—and stayed for the next 23 seasons. “It’s a sign I’ve been treated well,” says Brennan. “I’m privileged to have been here.” He survived long enough to witness a fair share of success, too (playoff wins notwithstanding), as well as personalities, controversies, and press conferences of every stripe. Being a PR director for an NFL franchise is a thankless job. You oscillate between getting bombarded with requests from pesky media members on deadline and asking favors of reluctant players and coaches between meetings and practices. If your name is in the news, it’s probably because there’s a fire you’re attempting to put out. On- and off-field struggles reap negative coverage, and winning merely increases demands. Brennan is the guy in the middle, manning the door that guards what goes on inside the organization and how much of it gets out. He’s handled it well. Over more than two decades of wins and losses—of both the PR and scoreboard variety—Brennan has consistently been regarded by the sports media as one of the best in his profession. On the eve of his retirement this offseason, he discussed the things he’ll miss (free Bengals gear), the things he won’t (battling the press on the stadium deal), the art of wrangling A.J. Green, and the time Mike Brown ruined Christmas. You started covering the team in 1984—any stories stand out from that time? With [head coach] Sam Wyche and [quarterback] Boomer Esiason as the two leading guys on your team, as a beat writer, you never lacked for controversy and exciting things to cover. I found an old Cincinnati Magazine profile of Sam Wyche from 1991 in which you were quoted saying Wyche had once thrown you out of his office because of a story you were working on. Oh yeah, I remember that well. I was pursuing a story: Sam had made some very strong statements about the officiating after a game. As the week went on, I felt it was my due diligence as a reporter to check with the league office if any [fine] was forthcoming. Sam got wind of that and didn’t like it and got very angry. But truly the charming thing about Sam was that he would blow up at you one day every month, and the other 29 days he was really a fun and interesting guy to deal with. Didn’t hold grudges. Mike Brown has kept a rather low profile the past couple decades, but reporters say he was more accessible back in those days, from a media standpoint. For sure. Mike respected the role of the media, that our job was not to be a publicity organ for the Bengals, but to report on the team independently. You knew where you stood with him. When you were on the beat with the Bengals in those days, the one thing you had to make sure you did every day was just check in with Mike Brown. He would take your call, and Mike’s home phone number—it still may be, and he probably wouldn’t care if I said it—was in the Cincinnati phone book. You want me to tell you about the time my wife yelled at Mike Brown? Absolutely. I thought you might. It was Christmas Eve, 1991, the day Sam Wyche left the team after a meeting with Mike Brown went unexpectedly awry. Sam walked out of that meeting feeling he had been fired, and Mike genuinely felt that Sam walked out after resigning. That’s never to be determined. But Al Heim, the former PR director, called me about noon on Christmas Eve and said Sam had resigned, and of course that upended my existence. I put in a call to Mike—first thing you do on the beat, call Mike. Couldn’t get him right away, but I wasn’t concerned. I hurriedly left the house to chase the story, and about 30 minutes after I left, Mike called and my wife Valerie answered the phone. And of course she was all upset, and she said, “Do you know how many people’s Christmases you have ruined today?” And Mike, true to his nature, was very polite and apologetic and said, “I’m really sorry, this was not something that was intended.” Mike understood. How did you land the position with the team? [Mike and I] just had that kind of a good relationship. It gradually just seemed to dawn on people that I was the guy Mike would want. [And] I was interested in pursuing it. At the end of the 1993 season, he offered me the job. I will say, it was a bad year for the Bengals. They were 3–13. I went to New Orleans for the final game and did a season report card and gave everybody grades, and I gave Mike Brown a D-. But that didn’t factor into his thinking, and I took the PR job starting with the 1994 season. I know you hate talking about yourself, but you are always mentioned in media circles as one of the best PR directors in professional sports. How do you approach the job? Having been a media person, I like the news media. I enjoyed being in the media. I think I’ve just tried to have a communicative relationship with the media, respect what they have to do. The worst thing a PR director can do is lie or deceive in any way. That will kill your reputation immediately. So I pledged that I will always offer the truth, but I’m not going to always feel obligated to offer you the whole truth. If there is something negative, I respect your right to pursue it, but don’t expect to get it from me. I don’t think there was any magic to it. You just deal with it day-to-day and try to be as honest and fair as you can. In what ways has it changed since you started? The way media has changed. It’s splintered and spread out through all kinds of mediums, and sometimes it’s a little hard to tell what’s legit and what’s not. People are getting their information in different ways, but we still have to make a decision of who we’re going to allow media access to. We’ve really kept that pretty traditional, because there’s only a limited amount of time and space you have to offer up. I’m sure there’s a lot of independent website media doing good work, but anybody can have a website, so we’re wary of that. Many will say they are written by passionate Bengals fans. Well, sorry, that’s the wrong thing to say to the team. We love passionate fans, they’re the reason we’re around, but they aren’t professional media. The other part of the job is dealing with players and coaches. Which is more challenging to deal with—someone like Chad Johnson, who was very outspoken, or someone like A.J. Green, who is quiet, not very forthcoming, doesn’t like the attention? Both great receivers, but totally different personalities. I wish A.J. would do a little more media, but for as great a player as he is, he truly just does not care about media attention. I’ll walk up to him and he’ll kind of shake his head and I’ll say, “All right, two things, please do two things this week. Here they are. I won’t ask you to do anything else.” Usually he’ll say yes. If I’ve got three things on there, he’s probably going to cancel one on me. Chad was a media-feeding beast, of course. A pleasant, fun, funny personality, but a little bit harder to have a manageable PR relationship with. He did what he wanted to do. How has your relationship with Mike Brown grown over the years? Oh, I think just steadily and solidly. Mike said he always liked my writing ability. He is a guy who, if you send him a snail-mail letter, he feels some sense of obligation to respond and honor the fact that you wrote him. Mike got a lot of critical letters during those bad seasons, and he valued my help in helping him draft responses. What impact do you think those years and letters had? He doesn’t appear to be a person who cares too much what other people think of him, but did those things bother him? Sure they did. Nobody’s life is all roses, and he just accepted that as one part that was not fun for him. But he never let it shake his own self-concept, and he still soldiered on, running the team as he felt was best to run it. Did you ever feel obligated to suffer the slings and arrows for him during those times? I would take some arrows for Mike. I think that would be expected, or part of being the spokesman and aide. But did I ever, really? I don’t know. He was pretty forthright always in taking arrows himself. What’s something most people misinterpret or don’t know about him? 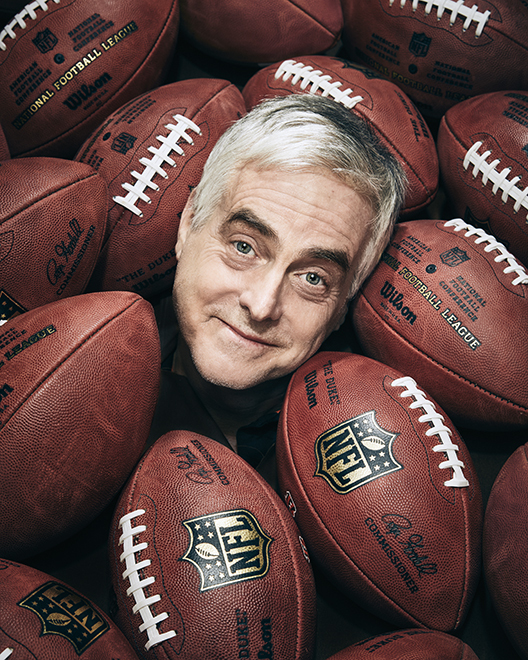 In the struggling years, Mike used to get criticized as not a “football person,” which could not be further from the truth. Mike grew up in a football life, grew up around the Cleveland Browns. He doesn’t talk about it much, but my understanding is that he was a pretty decent college quarterback at Dartmouth. I’ve always said Mike Brown loves history and culture but has traveled very little. All he really wants to do is run the football team. That’s what he wants to do every day. Mike is a pretty low-key, polite guy. He drives a mid-level Chevy Impala company car. He doesn’t care [for] the ostentatious trappings of being a person of considerable means. What did you enjoy most about the job? It’s just exciting. I’ve always loved sports, ever since I was a kid, so I’ve always wanted to be in sports. I am ready to move on to the next phase, but it’s been fascinating to be a part of something so entertaining and attention-grabbing. What is that next phase? Well, my three children and two grandchildren are all still here in Cincinnati, so my wife Valerie and I, we won’t be going anywhere. We love living in Clifton. I would like to do some more volunteer work, get more involved with my church. You know what I’ll really enjoy? Going to a Bengals game. I’m sure I’ll still go to some, and when it’s over—leave. Go home.